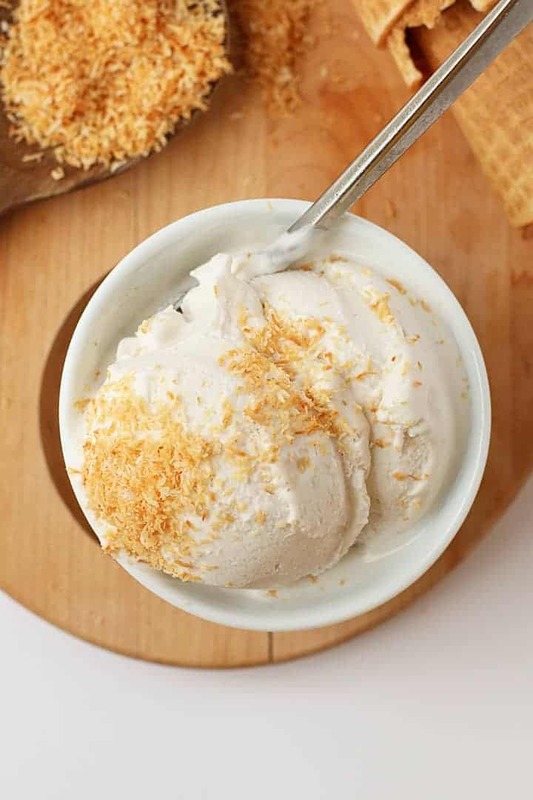 A rich and creamy coconut milk ice cream made with just 5 ingredients for an easy and delicious homemade vegan and gluten-free ice cream treat. I have returned home from my travels! After two back-to-back trips, first to New York City and second to England, I have to say it is good to be home! Dare I say, there are few better feelings IN THE WORLD than that feeling of falling asleep in your own bed after several adventurous weeks of travel? As I settle back into my Portland home, I eagerly look forward to summer. This past weekend the kids and I started creating our annual summer bucket list. These bucket lists always look pretty same from year to year: beach trips, camping trips, berry picking, bike riding. This year, I’ve added a few new ones to my list. Most notably, or perhaps I should say relevant, making homemade ice cream together. 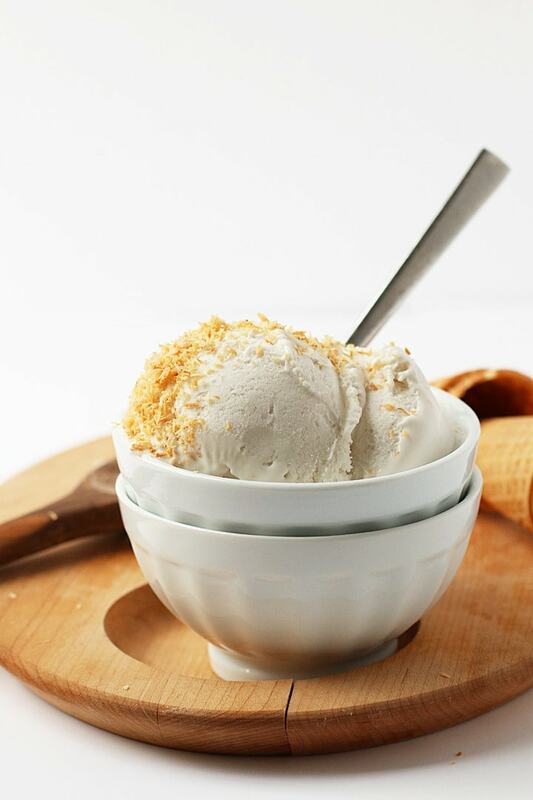 And we’re going to start with this creamy coconut milk ice cream. Let’s take a look at how to make homemade vegan ice cream! I have experimented with a lot of different bases for vegan ice cream. Among the options are frozen bananas, cashews, fresh coconut meat, and coconut milk. 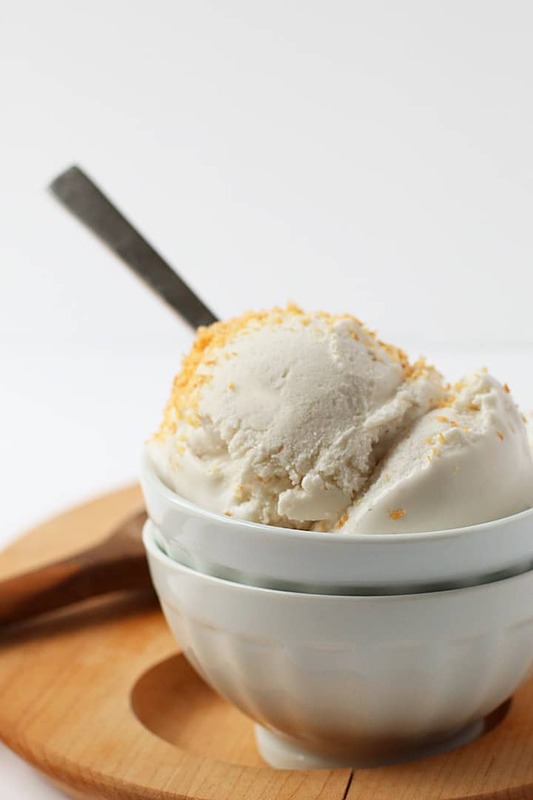 When coconut enhances the flavor of the ice cream (rather than distracting from it) it is my one of my favorite option for a vegan ice cream base. Full fat coconut milk is rich, thick, and similar in consistency to the heavy creamer that is typically used in ice cream. Therefore, when made right, it has the most similar texture to that of cow milk ice cream. And because it is so delicious all on its own, I decided to create an ice cream that celebrates the pure flavor of coconut with just 5 simple ingredients. For those of you who are new to the idea of making your ice cream at home, it’s a whole lot easier than you might think. While it takes some forethought (making time for freezing and chilling) it uses very little technique to get that perfectly rich and creamy consistency. 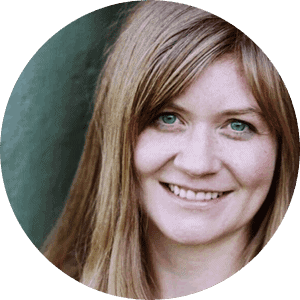 All you need is a recipe (which I’ve got for you) and an ice cream maker. If you don’t have an ice cream maker, I HIGHLY recommend you get one. I’ve been using this one for the past 5 years and I love it. It is compact and makes the perfect creamy ice cream every time! In 5 years and MANY hours of use, I have never had a problem with it. Making homemade vegan ice cream with an ice cream maker is a super simple process but it takes some planning ahead. Before you can begin, you must place the bowl of your ice cream maker in the freezer overnight. This ensures that the ice cream bowl is chilled enough to churn your custard into ice cream. Once your ice cream maker bowl is properly frozen, follow these step-by-step instructions on making the best coconut milk ice cream. Start by setting aside 1/2 cup of coconut milk. Heat up the remaining coconut milk, sugar, and salt in a small saucepan, whisking until sugar has dissolved. In a separate bowl, make a slurry with the cornstarch and the reserved coconut milk. Add it to the saucepan and cook, stirring frequently, until the ice cream base begins to thicken, fully coating the back of a wooden spoon. Transfer the custard to a shallow container, cover, and refrigerate for at least 4 hours, until the custard is chilled all the way through. Add the chilled ice cream base to the frozen ice cream bowl and churn according to manufacturer’s instructions. Church until it becomes thick and resembles soft serve. 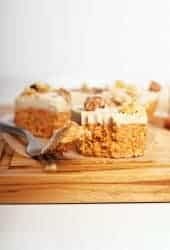 You can serve now or transfer it to loaf pan and store in the freezer until ready to serve. Allow 5-10 minutes to thaw when removing from freezer. While it does takes some time, making homemade vegan ice cream is so simple! Can I make coconut ice cream without an ice cream maker? While I totally recommend getting an ice cream maker ASAP, you can make a creamy custard without the machine. To do this, make your ice cream base as outlined above. Once it’s ready, transfer it to a baking sheet and place in the freezer. When the ice cream is frozen, break it into chunks and blend it in a food processor until it becomes smooth and creamy. This may take up to 10 minutes. Transfer to a loaf pan refreeze. 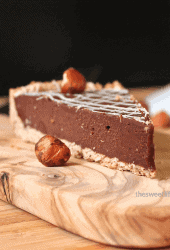 You won’t get quite the same creaminess, but it works in a pinch! Why won’t my ice cream thicken? Boil your coconut ice cream base for at least 5 minutes. The custard should become thick, fully coating the back of a wooden spoon. 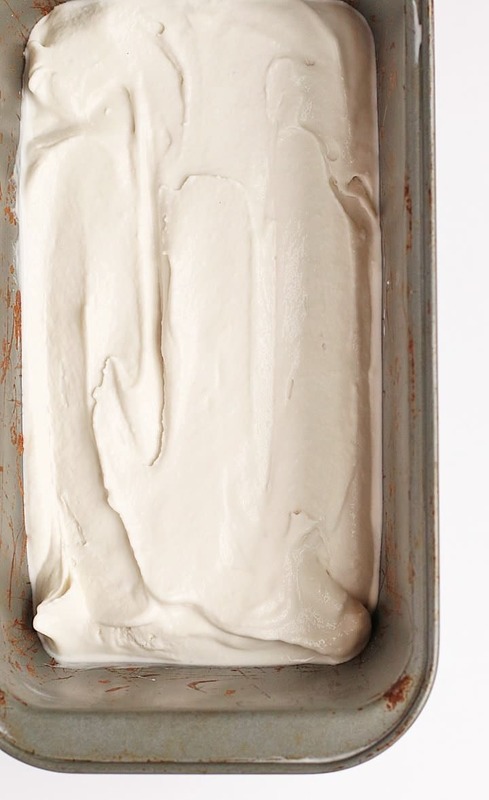 Freeze your ice cream maker base for at least 8 hours before using. This is to freeze the center of the base which is essential in getting thick vegan ice cream. Chill the ice cream base for at least 4 hours before churning. If the ice cream base is too warm, it will melt the center of the ice cream maker and never harden. 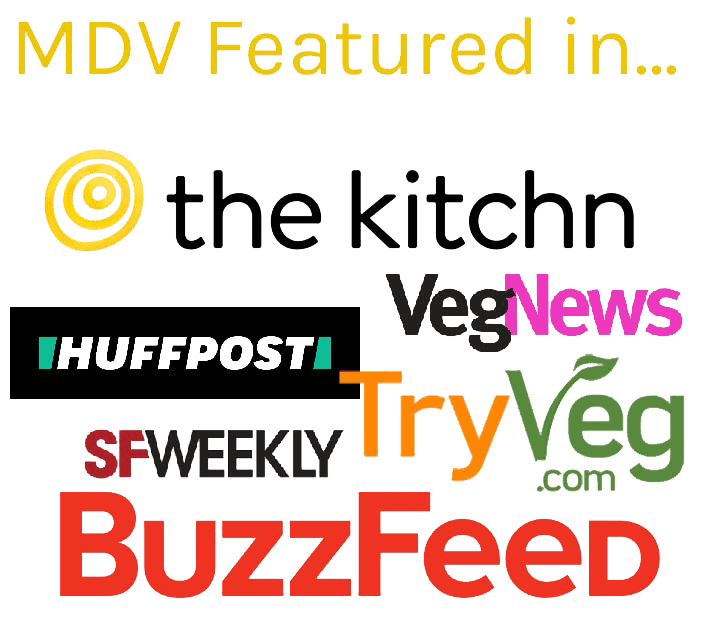 Now that we know how easy it is to make homemade ice cream, let’s take a look at some of my other favorite vegan ice cream recipes. Ready to cool down and enjoy summer? Let’s take a look at the recipe card below. A rich and creamy Coconut Milk Ice Cream made with just 5 ingredients for an easy homemade vegan and gluten-free ice cream treat. The night before place the bowl of your ice cream maker in the freezer to freeze all the way through. Measure out 1/2 cup of coconut milk and set aside. Add remaining coconut milk, sugar, and salt to a small saucepan. Place over medium heat and whisk until sugar is dissolved. Add the vanilla extract. Stir in the cornstarch to the reserved 1/2 cup coconut milk until well combined. Add cornstarch/coconut milk mixture to the saucepan and bring to a boil, stirring frequently. Boil for 5 minutes, stirring frequently, until the cornstarch is completely cooked and ice cream base has thickened. Transfer to a shallow container, cover, and refrigerate for at least 4 hours. Add chilled ice cream base to frozen ice cream bowl and churn according to manufacturer's instructions. Church until it becomes thick and resembles soft serve. You can serve now or transfer to a pint-size container and store in the freezer until ready to serve. Allow 5-10 minutes to thaw when removing from freezer. Well, i would say that this summer is going to be very delightful for me. Loved this coconut milk ice cream. Just created it and then after writing the comment. My family is impressed as this is a new desert for them as well as for myself too. Thank you my daring vegan for the wonderful sweet. If i could upload photos of mine created one, i would definitely have shared it here. I want to make this Coconut ice-cream. Thanks for pointing that out. I’ve fixed the recipe. Whaddya know, I had some yummy overnight oats with canned coco milk this morning and wondered if I could make yummy ice cream with it. So I googled it and your blog called to me. Go figure, I just moved to Portland a few weeks ago. 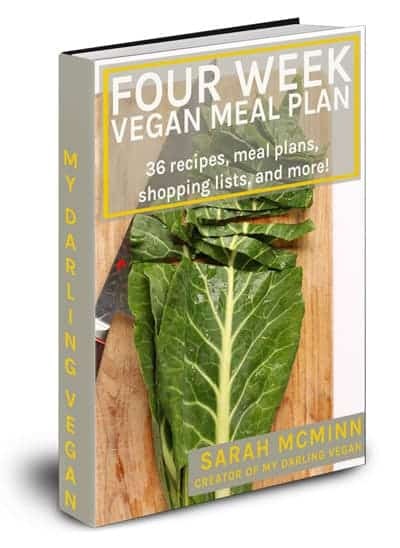 Yay life and yay delicious vegan recipes! I made this and it never got thick in my ice cream maker! Any suggestions on where I might have gone wrong? 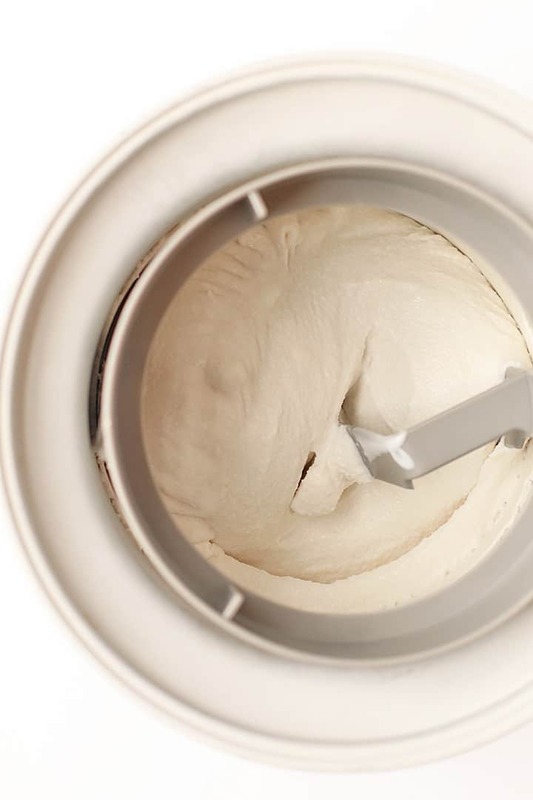 Was your ice cream maker completely chilled? And your ice cream base? I might need more information in order to help troubleshoot it! Could I pour into Popsicle molds? Did it work in the popsicle mild? Yeah, they should. Just make sure to freeze it completely solid or you might have trouble getting the popsicles out. For some reason everytime I make ice cream with coconut milk or cream and put it in my ice cream maker, I get these gritty chunks of coconut. How do you guys avoid this happening? Otherwise this is a fantasting tasting recipe. 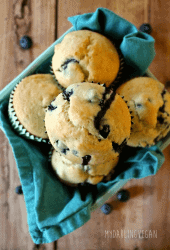 One recipe that I have used has you put all ingredients into a blender to mix. This breaks up the fatty coconut chunks in the canned milk. Thank you for sharing this recipe. I made it and it turned out great. What I love about this recipe is that it provides a terrific ice cream base for any flavor. I threw blackberries into it! Yum! Would high altitude affect the amount of time needed in the churner? I’m not quite sure. Perhaps a bit but you can just churn until you get soft serve consistency.